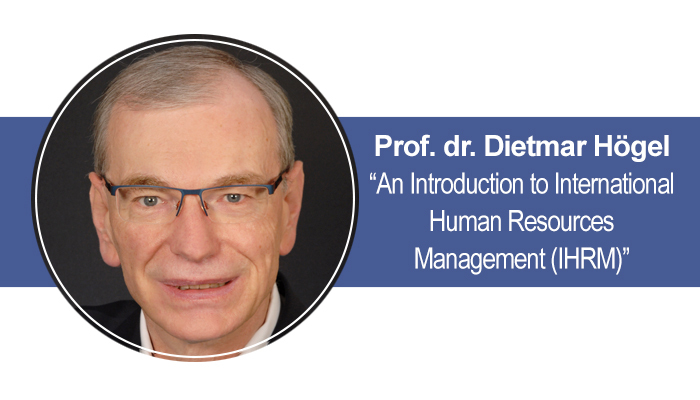 The Faculty of Business Management is pleased to announce the lectures to be given by Dr. Dietmar Högel, Professor for Human Resource Management and Law at Heilbronn University (Germany), Faculty of International Business. at 14:30-16:05 pm and 16:20-17:55 pm on 27 February; the Auditorium SRK-I 704. The lectures are organized and moderated by Assoc. Prof. R.Korsakienė, dr. B.Peyravi (Department of Management). at 10:20 - 11:55 am and 12:10 - 13:45 pm 28 February; The Auditorium SRK-I 704. The lectures are organized and moderated by Assoc. Prof. R.Korsakienė, dr. L.Lobanova (Department of Management). The lectures will highlight core issues of IHRM and focus on the so-called Expatriates (Expats), i.e. employees sent abroad by their companies on business assignments and therefore relocating to a host country – often accompanied by their spouses and families. The lectures addresses students of HRM and (International) Management as well as anyone considering to work abroad in their professional futures or with a general interest in Intercultural Management. Teaching HRM and IHRM Professor Högel draws on his rich work experience as a manager in the world of publishing and as a “commuter expat” to Russia where he set up a subsidiary company of the leading legal publisher in Germany in the 1990s. His keen interest in international academic relations is reflected by his role as coordinator of Heilbronn University’s partnerships with Latvijas Universitate and Banku Augstskola (both in Riga), Sochinski Gosudarstvenni Universitet (Russia) and Kingston University (UK). His motto is: “docendo discimus” - by teaching, we learn (borrowed from Seneca). For more on Prof. Högel’s biography visit his profile on LinkedIn.